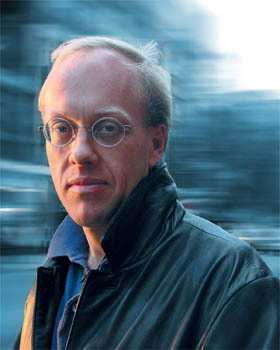 Author and journalist Chris Hedges joins us in the studio for a wide-ranging discussion of current events. He spent nearly 20 years as a foreign correspondent, working for the New York Times, NPR, and the Christian Science Monitor, among other news organizations. Author and journalist Chris Hedges joins us in the studio for a wide-ranging discussion of current events. He spent nearly 20 years as a foreign correspondent, working for the New York Times, NPR, and the Christian Science Monitor, among other news organizations. He currently writes a weekly column for Truthdig and his latest book is Death of a Liberal Class. Mr. Hedges will be speaking at Maryland Institute College of Art at 7 p.m today. For more information click here. During Hour 1 of the MSS yesterday, I thought that Chris Hedges delivered one of the most eloquent indictments of the 1% that I’ve ever heard. It was scathing too, which I always appreciate. His words were so powerful, I couldn’t wait to listen to the whole thing over again. So today I dialed up [http://www.steinershow.org/radio/the-marc-steiner-show/march-26-2012-hour-1], clicked on the podcast’s triangular button — and listened to what? the first third? the first half? of Hedges’ remarks. Man, was I disappointed. “Well, we’ve undergone a coup d’état in slow motion, a corporate coup. We live in a system that political philosopher Sheldon Woolen??? describes as inverted totalitarianism. And by that he means it’s not classical totalitarianism, it doesn’t find its expression through a demagogue or a charismatic leader but in the anonymity of a corporate state. I’m sorry that you’ve been having problems with our podcast. I just was able to listen through to the whole episode online, so it’s possible that your computer just didn’t load the entire file. You could try refreshing the page, or you could also right click on the file name below the media player to download the mp3 to your computer, and listen to it there. Please don’t hesitate to let us know if there’s anything else we can do!